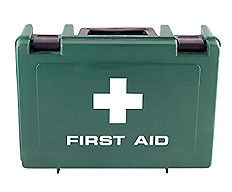 The RYA First Aid course is a one-day course covering all the usual first aid subjects, but from a boating perspective. It is aimed at anyone who goes afloat, whether on inland waters, rivers, estuaries or on cross channel passages. In a medical emergency a little first aid knowledge and immediate action can save lives, especially in remote locations. This one-day course is designed to provide a working knowledge of first aid for people using small craft and to support skippers. the Senior First Aid certificate needed by offshore racers subject to ISAF’s regulations on first aid training (OSR 4.08.4). The course is recommended by the MCA and HSE. Courses are held in Wickford, Essex. 10 minutes from Junc 29 of the M25 or by train, 35 minutes from London Liverpool St. The course costs £120 and includes the RYA pack that will help you through the day and which you will take away with you. Your certificate is also included. To book and purchase a course, just click the below “Add to Cart” button. The RYA First Aid course is designed to provide a working knowledge of first aid for all those who go afloat, on inland waters or up to 60 miles offshore. The syllabus is based on the recommendations of the HSE and the MCA.